I've not sent out any requests for a long time, but I did send out to a few private signings. Today I received two of those back. 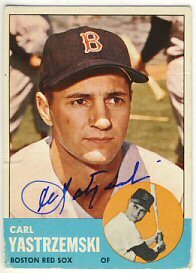 I sent in a 1963 Topps for a Carl Yastrzemski signing. I've got just a little over half of the 63 set signed, so a long way to go. 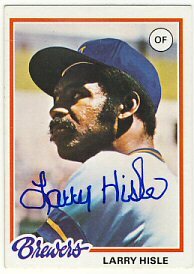 I also received three cards back from a Larry Hisle signing, including his 1972 Topps, 1978 Topps and 1978 Topps R.B.I. Leaders. 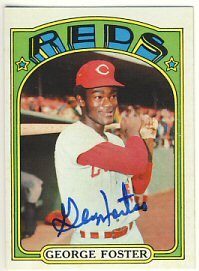 I need to keep my eyes out for a George Foster signing to complete the R.B.I. Leaders card. I'm also at just over 50% on the 1972 set, and only at about 20% on the 1978 set. 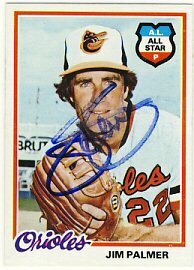 Maybe I'll focus on the easy and free signers of the 1978 set this winter. 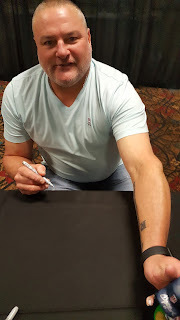 Today I attended the Minneapolis Sports Collectibles Convention at Canterbury Downs in Shakopee, MN. My main purpose for attending was to get Chuck Knoblauch and Junior Ortiz to sign their bobbleheads from the 1991 World Series set. As usual, this event was very well-organized. 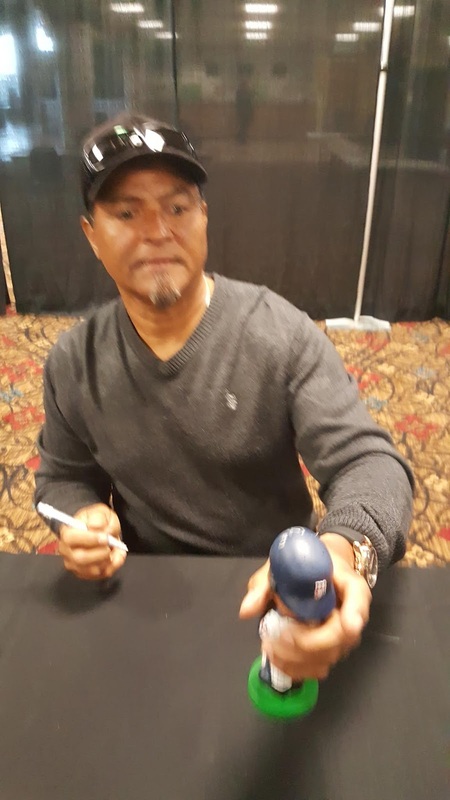 I met Junior Ortiz first. Shortly after meeting Junior Ortiz, I met Chuck Knoblauch. 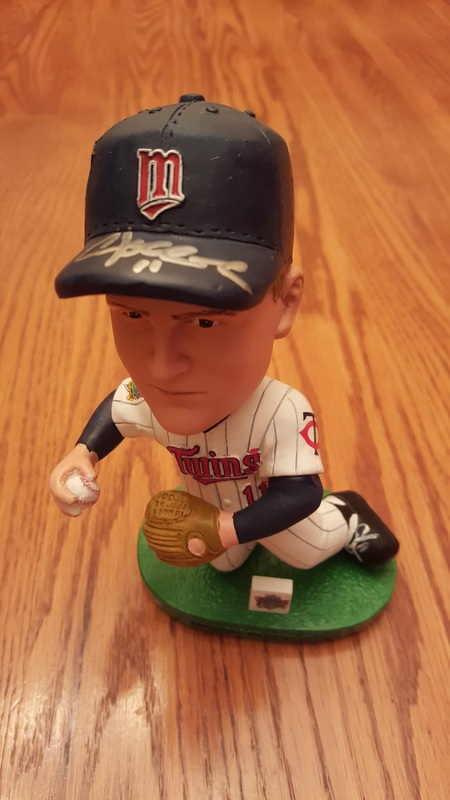 He hasn't been around the Twin Cities much, so I was happy to have the opportunity to get this signed. 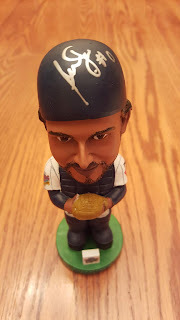 After getting these two bobbleheads signed, I need six more to complete the set (minus Puckett). 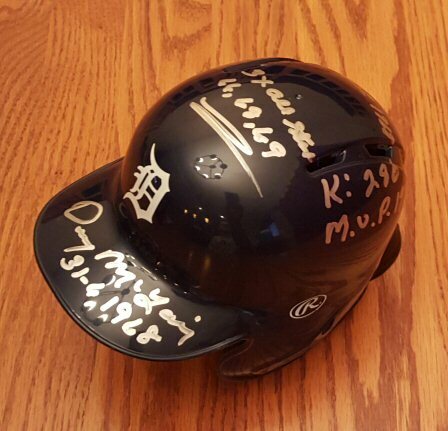 Denny McLain was signing at the event and had his own booth selling a variety of items. I bought a mini helmet that he signed with a bunch of inscriptions. I also bought a couple signed Metrodome banners including one with Torii Hunter on one side and Ron Gardenhire on the other side, and a second one with Johan Santana on one side, and Juan Rincon on the other. I need to flatten them out a bit for a few days before hanging them. I'll take pictures of them then. I ran into fellow-collector Randy, who I see at many of these events. It's always nice to run into him. He ended up being first in line for Knoblauch! Nice to see you Randy! Maybe next time we'll have more time to talk. I send so few requests these days that it's rare to get two back on the same day. But today, I did. 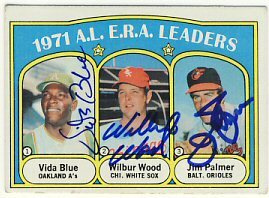 Jim Palmer finished off my 1972 Topps ERA Leaders card, already signed by Wood and Blue. 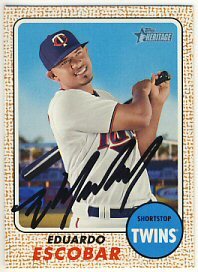 And I got back a card I sent off to Eduardo Escobar at Twins Spring Training way back in March. Even though he got traded to the Diamondbacks, he was kind enough to keep track of his mail and respond. 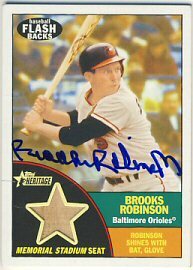 I had previously bought this card signed by him thinking that I wouldn't get this one back. I had all but given up on this one. 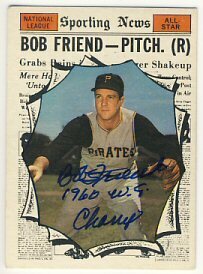 Nearly four years ago, I sent off this 1965 Topps to Clay Carroll. 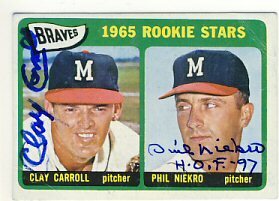 The card had already been signed by Phil Niekro. 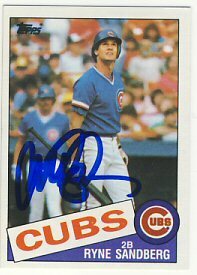 Carroll is a pretty good TTM signer and I saw a lot of successes recorded on SCN, so I assumed mine had gotten lost or something. I had even begun looking for another card to start over with, but this showed up in the mail today! 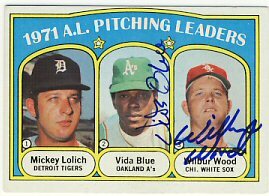 Yesterday I received a return from Mickey Lolich, who finished off my 1972 Topps Pitching Leaders card. 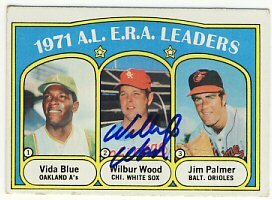 I have the ERA Leaders card out to Jim Palmer and hope to receive that back any day. 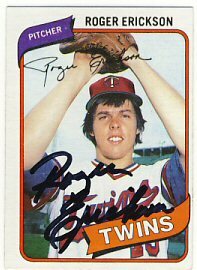 Former Twin signed his 1976 and 1978 Topps for me in about 15 days. My requests have really slowed down. 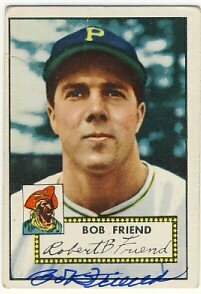 I need to buy some more vintage cards. 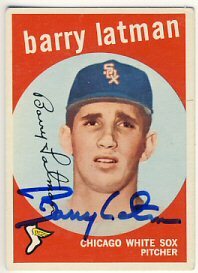 I may start up on the 1978 Topps set again, but would really like to get some 50's and 60's cards too. Today was a good day at the mailbox! 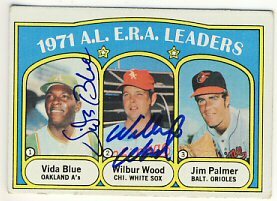 Vida Blue signed two of his 1972 Topps Leaders cards already signed by Wilbur Wood. 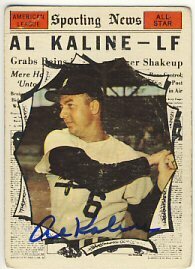 And Al Kaline signed his 1961 Topps All Star card. 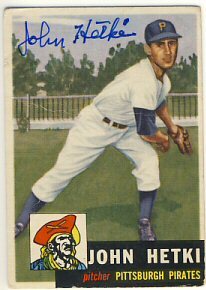 Today I received a return from John Hetki, who signed my 1953 Topps in three weeks. I only have a couple outstanding requests so I'll have to try to find some time to send out a few more. 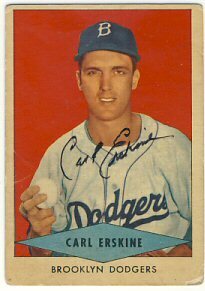 Today I received a ttm return from Carl Erskine and a George Foster card signed via a mail-in signing. 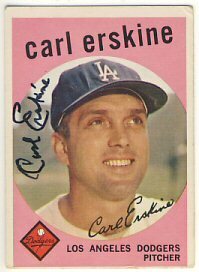 Mr. Erskine signed his 1952 Bowman, 1954 Red Heart and 1959 Topps for me. 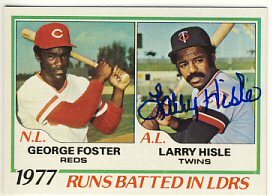 I added George Foster's signature to my 1972 set. I returned home from a long weekend to a few returns in my mailbox. 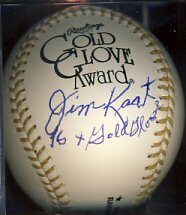 Jim Kaat signed a Gold Glove baseball for me for a donation that goes towards supporting youth baseball. 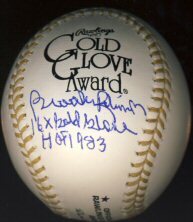 This joins Brooks Robinson in my Gold Glove baseball collection. Both players won 16 Gold Glove Awards! 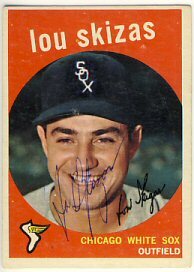 Lou Skizas signed his 1957 and 1959 Topps for me. 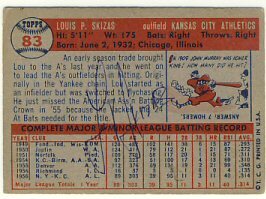 He signed the 1957 on the back, probably because the front is pretty dark. 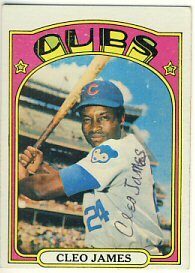 Finally, after four attempts, Cleo James signed his 1972 Topps for my set. I'm really happy to get this one back. 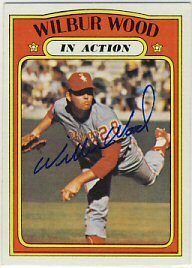 In the past, I have received my card back with a note to send to the MLBPAA for autographs, despite seeing others getting returns from him. I took another chance and am glad to add this to my collection. 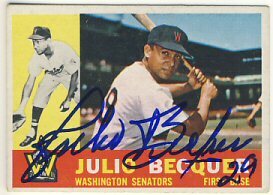 I've been getting more interested lately in getting some more former Twins' autographs on cards. 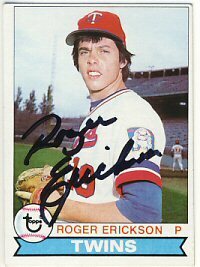 I sent a couple cards to Roger Erickson in July and he was kind enough to sign both his 1970 and 1980 Topps for me. 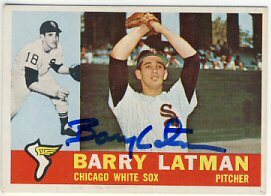 Today I received two cards back from Barry Latman, who signed his 1959 and 1960 Topps in a little over two weeks. 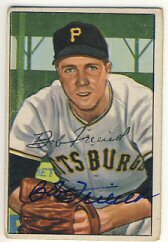 I have seven outstanding requests, including a couple private signings that will help add some cards to my 1963, 1965 and 1972 Topps sets. I've also been sending out a few vintage cards when I can find the time. 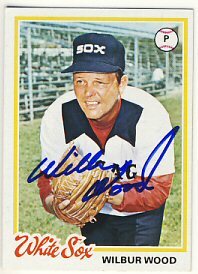 Today I received three cards I sent in to a signing with Wilbur Wood. 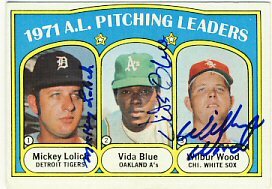 Mr. Wood is a good signer through the mail, but personalizes. I don't normally mind my cards being personalized, but he apparently also personalized multi-signed cards. I had two cards I wanted signed by all three players so I opted to pay for his signature. 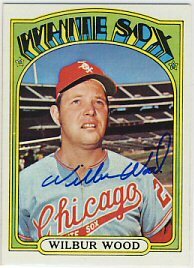 He signed the 1972 Topps cards of A.L ERA Leaders and A.L. 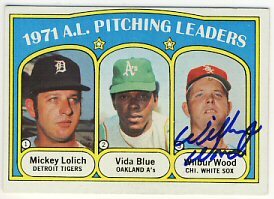 Pitching Leaders from the 1971 season. I hope to be able to get all three players to sign both of these cards. 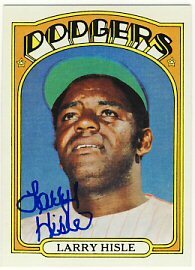 I'll probably send them off to Vida Blue next. 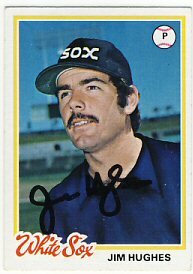 I also had his 1978 Topps signed. 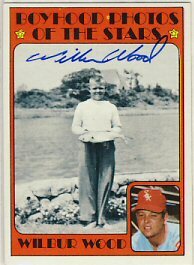 Mr. Wood has five cards from the 1972 set, including his individual card, his Boyhood Photo card, and an "In Action" card. 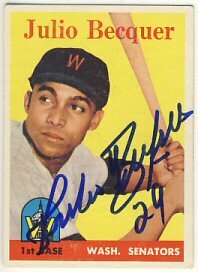 I know have all five of his cards signed from this set. 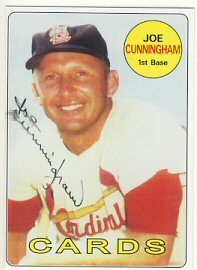 Today I received a 1955 Topps signed by Joe Cunningham. He returned it in about a month. He also included a signed card of his own, although it smeared a bit. I've sent to him before, and he's included these signed cards in the past. It's always a nice surprise to get something extra! I've purchased a small number of cards on Ebay that I'll be sending out as they arrive. Hopefully I'll continue to post at least a couple of successes each month. 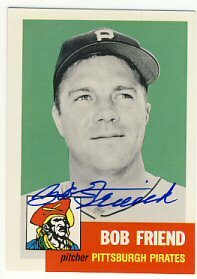 I received a great return from Bob Friend today. 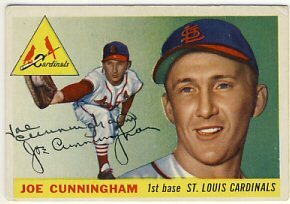 He signed his 1952 Bowman, 1952 Topps and 1961 Topps All Star for $15. 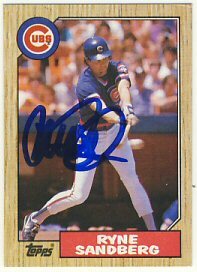 He was also kind enough to send along a signed 1991 Topps Archives card. 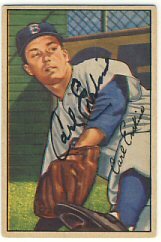 I already had the 52 Topps signed. I sent it to him a few years ago and he signed it in black. I thought I"d give a shot to upgrading it and hoping he'd sign in blue, which he did. 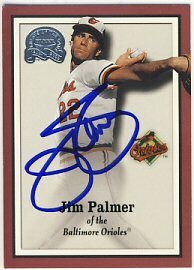 I was s little disappointed when I opened my return envelope from Jim Palmer. 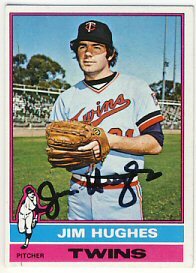 The 2000 Fleer Greats of the Game looked great, but the 1978 Topps looked like it was signed with a fading pen. But then I felt it and realized I sent a card with either a gum or wax stain on it. The pen didn't like that. My fault. I'm not sure if I'll send another one or not.